It's been a couple of years while since I built my first grinder and it's going strong. I love the machine. I do however have a problem with the time it takes to take the tool rest on and off and square it up. So I set off to make something using the lower tool arm receiver. 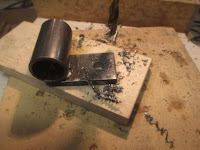 It must be durable, fairly easy to make and should cost less than $20. 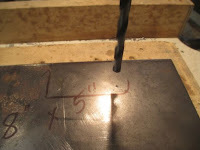 1/4" mild steel plate. Approximately 5" x 8". 1/4" NC x 1/2" flat head bolts, quantity 2. 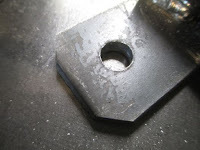 1/4" NC x 3/4" hex head bolts, quantity 1. 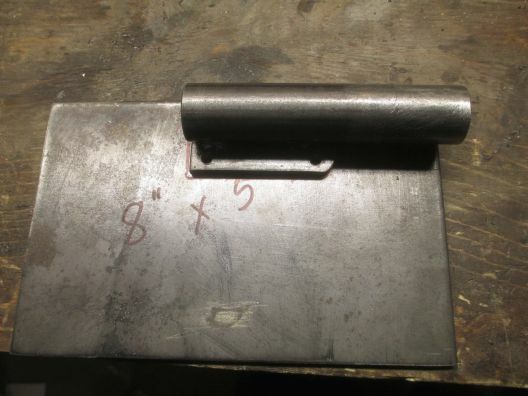 Cut a piece of 3/4" schedule 40 pipe at 5" long. Deburr. 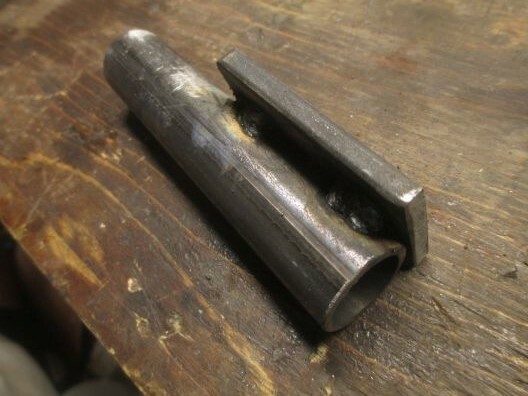 I welded the 3/4" pipe to piece of 1/4" x 1-1/2" x 3" flat. The ends line up. 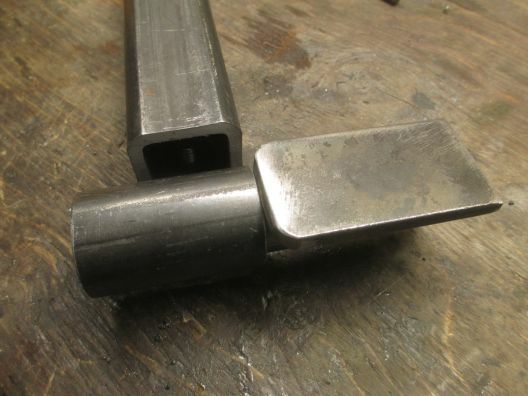 Clamp and weld. Cut a piece of 1" schedule 40 about 3" long. 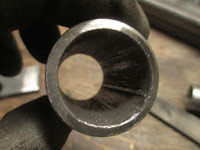 Clean the seam inside the 1" pipe with a file. Slip it over the 3/4" pipe. It should slide on and off without binding. Clamp another 1/4" x 1-1/2" x 3" flat bar on to the 1" pipe. Again align the ends as shown. Weld. Here I am drilling a 7/32" hole through the flat bar and the 1" pipe wall. 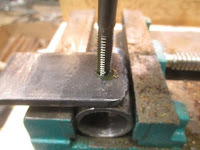 Now tapping to 1/4" NC. The bolt in here will lock the rest in position. Next I drill a clearance hole for a 3/8" bolt. I think it was a 25/64". This hole is centered about 1/2" in from the end. 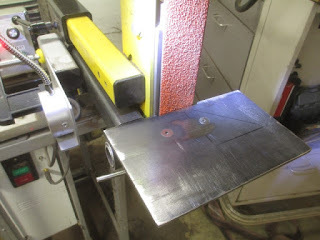 On the bandsaw I cut the corners off at 45° and then rounded them with the disc sander. I clamp the bar on to the end of the 1-1/2" H.S.S. 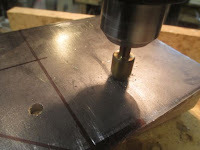 Mark and drill a 5/16" hole. Tap this hole to 3/8" NC. 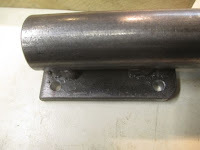 If you have a light weight wall, you'll want to tack a nut on the inside of the H.S.S. Bolt the bar on the bottom of the tool arm. You can see how the table will mount on the flat bar in the photo on the left. 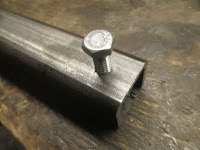 I drilled two 7/32" holes in the bar and tapped to 1/4" NC. 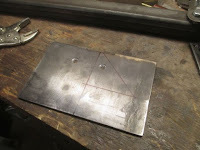 Now place the work rest plate on the bar, line it up straight, clamp and mark the holes for the table mounting screws. These holes are clearance fit for 1/4" bolts. On the top side, counter sink the holes to 82° . Test fit and mark where the belt is going to reside. 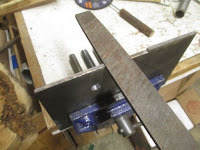 Then cut or file away the 2" for the belt, plus some extra on either side. 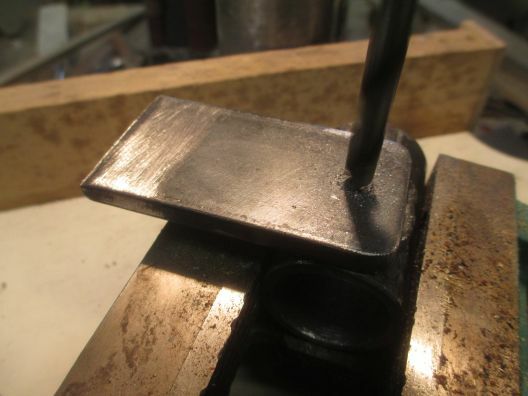 I made my notch about 2-1/4" total. This can be cut with the bandsaw, filed or even ground out with the grinder. The table top is ready to mount with two 1/4" x 1/2" NC flat head bolts. Put a spot of lock-tite on the threads so they stay in place. 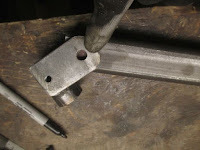 All that is left is to weld some round rod on a 1/4" bolt to make the table locking bolt. 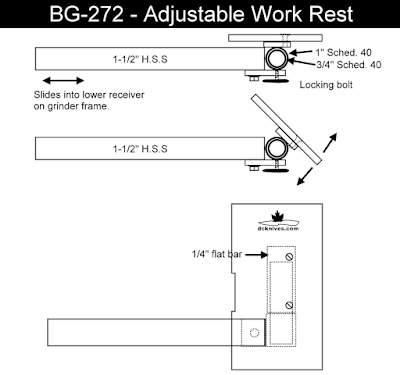 Loosen the table locking bolt and adjust the angle to the platen to 90° using a square. Lock the table. 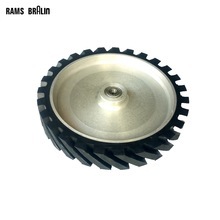 Very nice job, think I'll upgrade my grinder in the same manner. 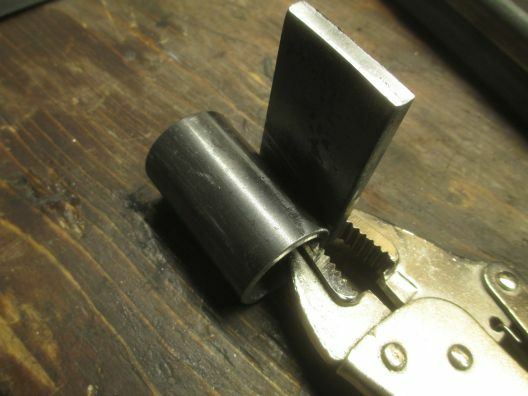 Why not weld it all together instead of bolting it? The bolted parts allow for adjustments. The table can tilt on the vertical axis and rotate as well. If you need to make adjustments for beveling, shaping scales, scarf joints etc., having these adjustable is very important. Thanks for the reply. I still don't see how bolting the table on allows for any adjustments? 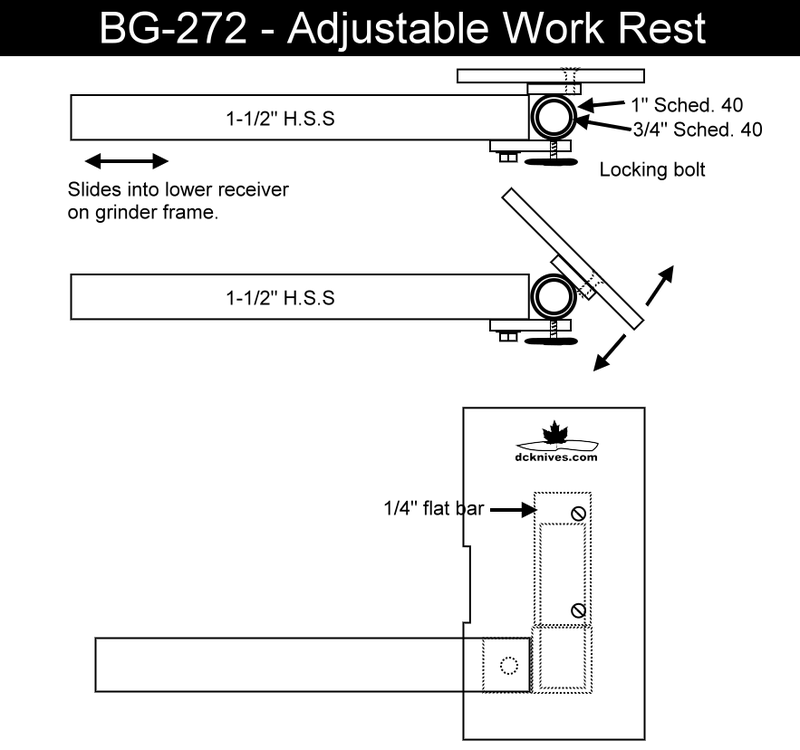 I understand how it rotates on the round pipes and locks in place, I do see how the bolt holding it to the square tube could be loosened to allow it to swing side to side but how does bolting the table down instead of welding allow for any adjustment? Loosening them wouldn't do anything that I can tell other than making the table loose, what am I missing? Sorry, I understand now. You are asking why I bolted the table plate to the movable frame. Yes, you could weld it on. I have another table, a little larger, that has holes for pins to go at 45° and 90°. This gives a sort of mitre guide. The two tables can be swapped if needed. There should be no clearance issues. 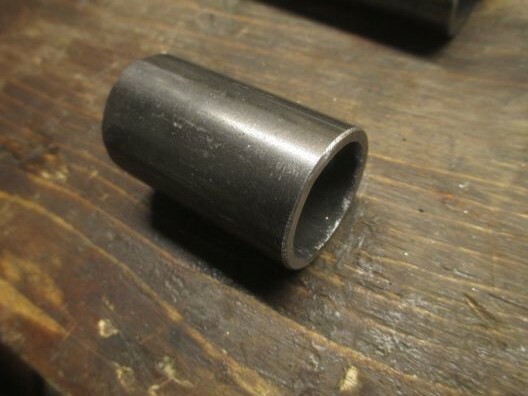 The 1" refers to the pipe's inside diameter. 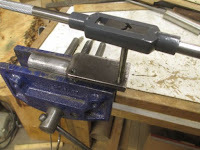 The outside diameter of 1" schedule 40 pipe is closer to 1.32" and added to the 0.25" flat bar table mount it should be sitting at 1.57" which clears the 1.5" HSS tool arm.